Products as seen by the Gear Junkie at Outdoor Retailer Winter Market, January 22 – 24, 2009. . .
GU Chomps Performance Energy Chews — GU Energy Labs’ latest athletic enhancer comes in the form of a gummy chew. 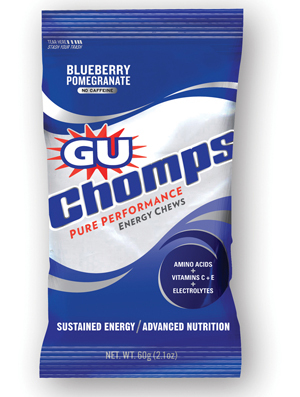 GU Chomps cost $2.20 per packet and are made to address an athlete’s craving for solid food during training or racing while delivering nutrients and electrolytes. The company will ship Chomps in March in Blueberry Pomegranate, Orange, Cran Apple, and Strawberry flavors. Nutritionally, the chews contain complex carbohydrates from maltodextrin and simple carbs from tapioca syrup and cane sugar, as well as antioxidants in the form of vitamins C and E (to accelerate recovery from hard workouts, according to the company).